'Zojaqan' is a poetic tale of loss and rebirth, a dreamlike adventure spanning ages built from the heart. Shannon Kind is mourning the loss of her son and that pain has swept her away to another world in a stunning debut from Collin Kelly, Jackson Lanzing, Nathan Gooden and Vittorio Astone. Falling among the clouds descending into the ocean, a weary soul is literally lost at sea left with memories of the son she lost. She inexplicably leaves our time and space and enters an entirely new fresh world, a planet dawning into existence. Kind is the only human on this planet with nary an inhabitant, except for some strange creatures she encounters. It's a world of her making and hers to explore. Zoraqan is hers to build while she reconciles her emotions and heartbreak. Her journey is represented in a surrealistic way without a linear story to hold on to much like her floating through the sky, untethered and free. Lanzing and Kelly create an epic fantasy, ethereal and magical, where Kind must survive and build. A fable of loss and renewal as expressed through this new land that needs guidance and a loving hand that only a mother like her can give. Woven throughout the story are snapshots of Kind's life on earth, as a daughter, a lover, a mother. We learn a lot about her even as she's swept from one dangerous eon to another in her new life. Her father an immigrant from Ghana pushed her to do her best as a runner when she was a kid. She grew up to become a postal worker and a loving mother. And then the son is gone. It's all beautifully illustrated by Gooden. As fluid and melancholy as the dialogue and narration are, Gooden's art is what makes 'Zojaqan' a unique experience. There are some scenes with little or no words and the story is told through Gooden's pencils. Sweeping views from the sky, under water, and on land provide the perfect canvas for Gooden's exquisite designs. From volcanoes to forests, to rugged shores and wide landscapes, Gooden whisks the reader away by the arm and immerses them in a wondrous and awe-inducing world. The beating heart, the moments that hit the hardest are the panels that depict her earthly life and most of all the sequence leading to her son's death and the aftermath. Gooden uses a sort of short hand in those panels that will wreck you emotionally. Vittorio Astone's colors are mostly soft, subtle pastels while Kind's past is layered in deep rich earth tones. Astone's color selection is perfect especially when featuring the distinctive and fierce creatures Kind finds on Zojaqan. Probably the most significant and important detail of the art is the expressive emotional roller coaster displayed in Kind's face throughout the issue. A history of happiness, resilience, apathy, love, joy, fear, pain, fear, determination, triumph, is shown in the face of a beautiful black woman that now transcends time and space chosen to build an entire new civilization. It seems whatever forces brought her to Zojaqan know that she can handle the task, given her tenacity. 'Zojaqan' #1 is a beautiful exploration of the human spirit transcending reality to give birth to a new world. This is science fiction and fantasy as poetry and Shannon Kind as the muse. She's transported to this primitive planet without explanation but is able to turn pain into power, apathy into action, and grief into grit. 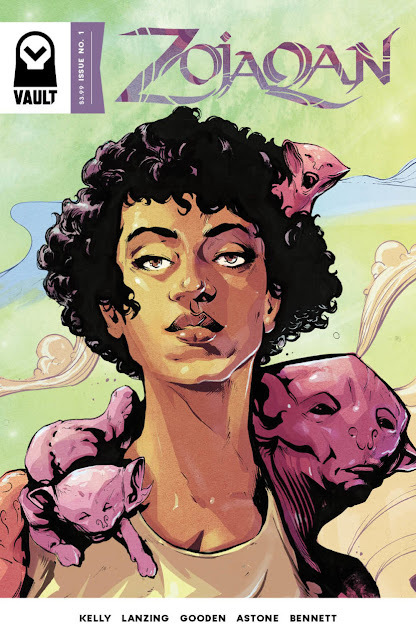 She is a champion that Kelly, Lanzing, Gooden and Astone bring to vivid life in one of most ethereal adventures in comics. If you're looking for something more nuanced and can appreciate a symphony of wonder and emotion than this is for you.